· 1612: Born Anne Dudley Bradstreet in Northampton, England. Well educated in history, languages and literature. 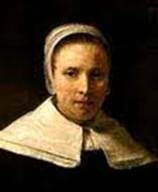 · 1630: with husband and family, boards the Arabella with other puritans, led by John Winthrop. · 14 June 1630: lands in Salem, Massachusetts. Continues moving to difference parts of MA. · 1647: brother-in-law John Woodbridge takes her work to England without her knowledge, publishing it as The Tenth Muse Lately Sprung Up in America, by a Gentlewoman of those Parts. · 16 September 1672: Anne dies at the age of 60 after giving birth to 8 children. · Written in reaction to her book published without her knowledge. · The persona explains that her book was taken to be published when it was not ready for that yet, but that she tried her best to edit it and make it fit for a second publication. · Main figure of speech is conceit (extended metaphor): book compared to a child. · Domestic subject matter not typical of an age where most writers are men.